I tried to find a new bios for my mainboard MS-6168 v2 (Packard Bell Bora Pro), but, with a great difficulties, found only older ones. Interested! Also interested in all Optiplex and Dimension XPS D CDs of the 1997-2000 era. For the driver library I have a Voodoo3 3500 TV driver disc, multi-lingual version 1.2 This one is newer than the 1.1 currently provided there. Also have a Creative 3D Blaster Banshee driver disc and a Creative SoundBlaster Live! Value driver disc. I think this would be a good candidate: if you have a Maxtor branded Promise PCI ATA 100 or 133, the Promise drivers won't work, and the Maxtor ones are now hard to find. I just found a site that is hosting them, and I just used them to install Win XP on an Asus TXP4 with one of these cards (so I know they are good), combined with a PATA to SATA adapter to control a 500 gigabyte seagate SATA drive. https://www.touslesdrivers.com/index.ph ... code=16384 Only on server 2 and 3, the Seagate link is 404. This is very much appreciated, thank you! My XPS D333 is most pleased with it. I uploaded about a dozen old nVidia Detonator/Forceware Drivers, as supplied by Nemo1985. For Windows 9X, dated 2001 to 2005. Also cleaned up the nVidia section a bit by renaming entries to make them sort more logically. I read somewhere that in Oct 2003 'Detonator' got renamed to 'Forceware', just to make things confusing. PS. I prefer people taking care of their own uploads, because you know; it takes time and effort. Though it seems the handing out of vogonsdrivers credentials has stalled. SquallStrife - I see you have been online at least once since I messaged you. Any chance of an account on vogonsdrivers, so I can upload any drivers I come across or already have that are not there yet? Justin1091 wrote: For the driver library I have a Voodoo3 3500 TV driver disc, multi-lingual version 1.2 This one is newer than the 1.1 currently provided there. Hmm, I expected some interest in these drivers since there are a lot of similar drivers out there with quite some downloads. Guess there are enough of these types of drivers on there then! I have the Audigy 2 Value Driver and Application CD that I would like to upload. This is the latest version of this software I have seen anywhere, so I thought I should upload it here in case anyone can use it. I recently dug up my Gravis Stinger gamepads (serial port joysticks) and the driver CDs that came with them. I did a brief search, and saw where someone uploaded the Gravis xperience drivers, but didn't see anything about the Stinger. Should I rip and upload the driver CDs, or is it such an esoteric joystick that there's no point, since the xperience drivers are already up? gerwin wrote: PS. I prefer people taking care of their own uploads, because you know; it takes time and effort. Though it seems the handing out of vogonsdrivers credentials has stalled. Yes, life has been a bit all over the place for me lately. I've just finished streamlining the account creation process for myself, until 20 minutes ago, creating an account meant SSH'ing to the VPS and manually running a SQL script in /usr/bin/mysql. Now I can do it thru an admin-only web interface in one click. Phew. - Your passwords are CaSe SeNsiTiVE. If you copy-paste and it doesn't work, check for leading or trailing spaces/line breaks that your highlight may have inadvertently picked up. - Read the "FTP Upload Guide" PDF. Yes, it predates the changeover to SFTP, but it still outlines the steps for post-processing your files after uploading them via SFTP. I only mention this because it's caught out one of our members big time in the past, and data was lost. - Informative but succinct names, and as much details as you can provide in the description. A copy+paste of the readme.txt or similar is perfect. Some kind of image or disk photo is gravy!! ** In defence of these entries, they were created when the site was still being developed, and were copy+pasted by me from the original thread on here. It's not Malik's fault at all, just legacy data. I've linked them here as an example of what we should avoid doing going forward. It is not really important, but the text line-height is not entirely proper. Text can overlap the text below it. It has always been that way. I think if you just remove line-height styles it should correct itself. Using Firefox here. I've implemented this, and it's fixed a lot of the layout problems I was seeing about the place. Cheers mate! 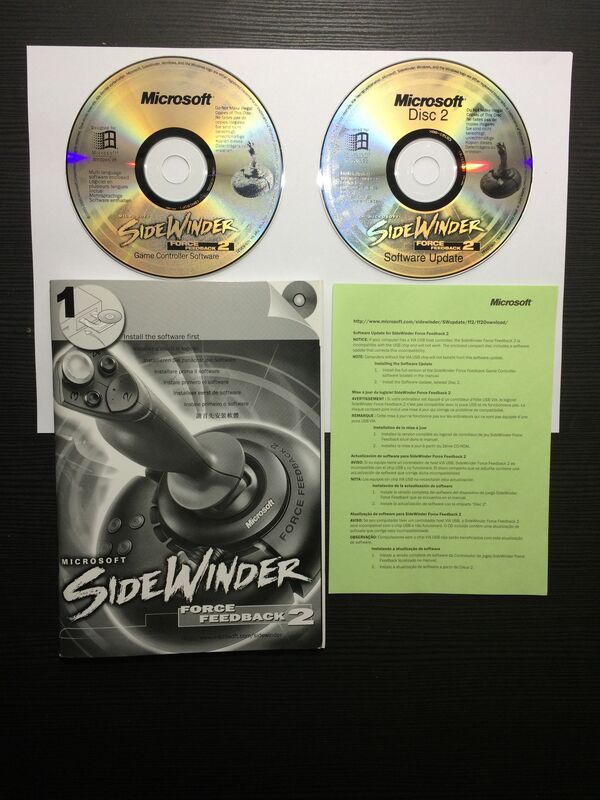 I purchased on Ebay a NEW Microsoft SideWinder ForceFeedback2 Joystick with original packaging (incl. 2 CD-Roms with drivers!). I would like to upload those two CD-Roms (ISO-Files) for the vogons-library. Hi there. As per the OP, I'm only comfortable creating accounts for established members. I'm sorry that I didn't get to respond to your post sooner, but I would be happy to upload the files on your behalf. I tried clicking your Google Drive link, but it says the folder has been moved to Trash? If you restore the folder, I can do the download in the next few days. Markot, these posts are from January, and I created your account in February. I can see that you've uploaded some other MVGA related stuff since then, were you having trouble with the items I've quoted here? But if you've got the 2K/XP package then feel free to upload it to the archive. PM incoming. Hamby wrote: I recently dug up my Gravis Stinger gamepads (serial port joysticks) and the driver CDs that came with them. Yeah man, go for it! Love your avatar, btw! I had a lot of fun making that image all that time ago. I just uploaded 17 files from various contributors in the thread. That should bring everything up to date. SquallStrife wrote: I just uploaded 17 files from various contributors in the thread. That should bring everything up to date. There were a few mentions of people wanting to upload to "VOGONSDrivers"/"Vogons Drivers" in other threads, I'll see if I can track them down. I've uploaded the 'Toshiba: Tools & Utilities CD-ROM: Tecra 520 / 530CDT' (https://www.dropbox.com/s/l44otimkeaoja0z/Toshiba.Tools%26UtilitiesCD-ROM.Tecra520_530CDT.iso.7z?dl=0) for the thread https://www.vogons.org/viewtopic.php?f=46&t=60925. I could upload the CD-ROM to Vogons Drivers, but I don't have permissions. I've also uploaded an image I've made of the boot diskette that came with my Tecra 520 CDT (an error occurred while trying to read the file IO.SYS in the diskette), but it's not an original diskette and I really don't know if it isn't just a normal Windows boot disk (more information about it, check the mentioned thread in the paragraph above). If you can, it might help someone in the future, thank you. Great! It reads a lot better now. Thanks for remembering my remark, and good to see you managed to find time for maintenance on this very useful repository. Just now uploaded those Tecra files, thanks peido!